On March 25, 1911, as workers were getting ready to leave for the day, a fire broke out in the Triangle Shirtwaist factory in New York's Greenwich Village. Within minutes it spread to consume the building's upper three stories. With ladders too short for a rescue, firemen had to watch in horror, along with hundreds on the street, as desperate workers jumped to their deaths. The final toll was 146 people – 123 of them women. It was the worst industrial disaster in New York City history until 9/11. 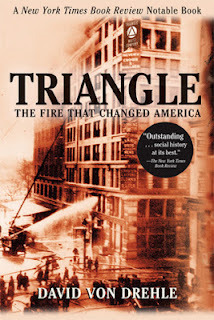 Triangle: The Fire That Changed America is a moving and riveting account of the Triangle fire of March 25, 1911, the deadliest workplace disaster in New York City for 90 years. It destroyed the lives of 146 workers, the majority of them young immigrant women. The author successfully brings to life the period before, during, and after the fire. He looks at the social and economic conditions of the time, working conditions in the garment industry, and the labor movement that women were gradually becoming a part of. Female garment workers were dismissed in large numbers for strikes and union activity. With the support of Clara Lemlich, a young immigrant from Russia, and upper-class allies, the plight of the predominantly female garment workers became more widely known and was taken more seriously. Unfortunately, safe working conditions, long hours, and workers’ compensation were issues that didn’t get addressed until years after the Triangle Waist Company fire. Von Drehle includes details about the workers – where they came from, how they lived, how they worked, and how they died. He looks at court and public records, and provides a list of the victims who perished. He also talks about the politics of the time, the Socialist movement, the corrupt Tammany Hall, the trial of Max Blanck and Isaac Harris, owners of the factory, and the high-priced attorney who successfully acquitted them of manslaughter. This is a fascinating look at life in the early 1900’s, a moving tribute to those who perished, and a grim reminder that workers’ rights must be protected, or they will continue to be eroded.